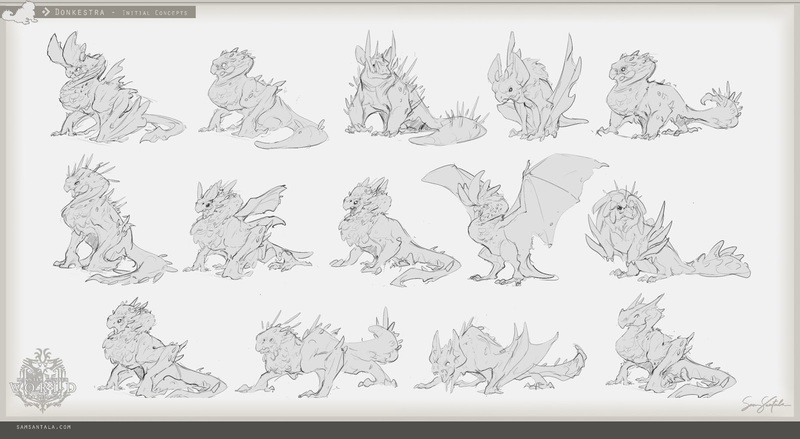 A creature/character design blog full of works in progress, sketches, and studies. I decided it had been a while since I created a 'Monster Hunter' creature, and an accompanying armour set. 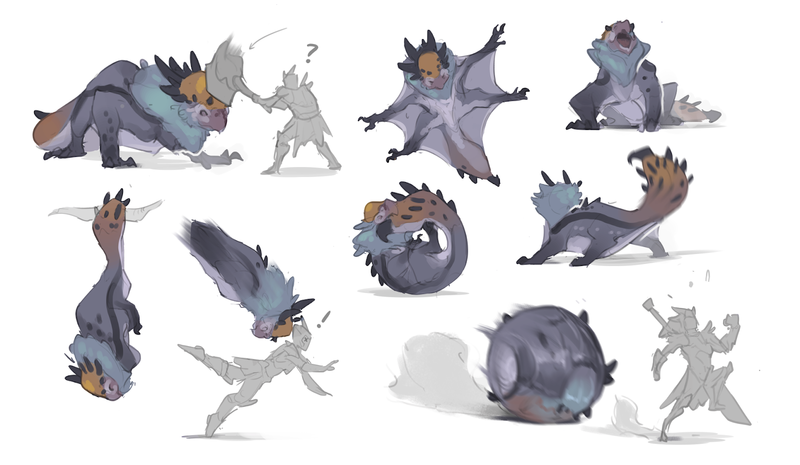 And with Monster Hunter: Worlds recent release and success, I figured now would be a good time to begin work on a creature design I had had in my head for a while. But originally I had not inteded the creature to work in this manner at all. I had begun work on this thinking that I wanted to create some form of infant. A creepy/cute monster, similar to that found in Pacific Rim. My first thoughts on what sort of gimmick this baby monster could do was to have it covered in a thick down, something that would cover the player and limit their movement, or slow them considerably. 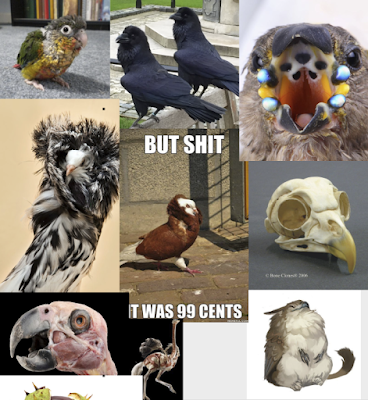 I began collecting references of birds, both their anatomy, and the strange feather arrangements that they sported. But my initial sketches were mostly just copying what I had seen in front of me. They weren't iterative, or novel at all. I began adding more types of anatomy to the mix, perhaps it could be closer to a pterosaur, or a bat? I could add longer arms, smaller legs. More defined skin flaps. Or possibly some sporting weapons of some kind. This was one of the first sketches that I really liked. It had a solid silhouette, it wasn't quite a bird, but also not clearly a reptile or mammal either. I thought this would be a strong base to begin working off and started making more variations of this creature. either by removing or adjusting parts, elongating the limbs, making the 'weapon' it's tail or back etc etc. Now what is different about designing this creature; (ain comparison to say, creating a creature for an art director or a professional project), was that I wasn't really following a brief. There wasn't a certain aspect I was trying to nail, but equally there was no real need to diverge too greatly and create a vastly different cast of creatures in the hopes that one would be aiming in the right direction and could be iterated upon. I was following my own internal compass, and so many of the initial sketches share very similar values. But it became clear to me as I was sketching these, that I had some aspect of a design that I wanted to see through. Things like spines, maybe a thicker tail, or strong forelimbs became repeated. And before long I had this collection of sketches. Now I had to narrow these down slightly. My problem was that I was still slightly smitten with my original design. I had changed slightly, and more sugar glider references were now evident throughout, but the silhouette read was so strong to me. And the horns really sold it. But at this point I had to make a tough call because I had noticed a trend in my creature work. One I thought it best to try and avoid. I just seemed to add horns to creatures a lot as a quick fix for a dull silhouette and to create something visually interesting. and I couldn't keep on doing this. It sucked, but as much as I loved it, I had to remove the horns. But this creature had to attack and have some kind of gimmick to distinguish itself from the rest of the Monster Hunter caste. Its limbs were made for gliding, and so too small to be iconic, its tail was used for gliding and whilst visually interesting, wasn't enough (I felt) to be gimmicky enough on its own. 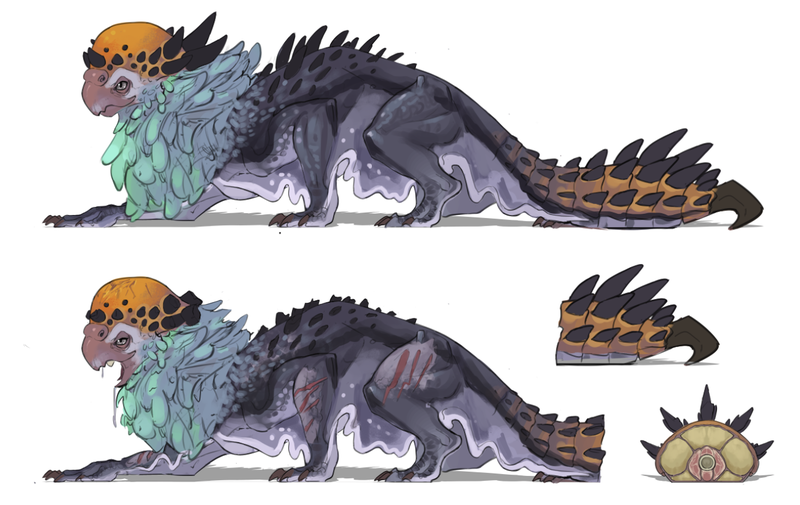 So after a few sketches I tried adding a more Pachycephalosaurus motif to the monsters head, and it felt perfect. It was visually interesting, but had a nice sweeping motion that perfectly fit the sweeping lines of the rest of the creature. 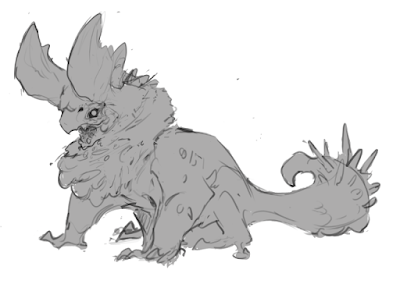 I needed to figure out what kind of colours this creature would be sporting too. But because a design can change so drastically after having some colours splashed onto it. I thought it best to also take a couple other sketches I had liked and see how they compared. The colours varied from more tropical parrot designs, to subtle desert colours, and also a bit of light pink, in case this creature lived in the Coral Highlands of Monster Hunter: World. 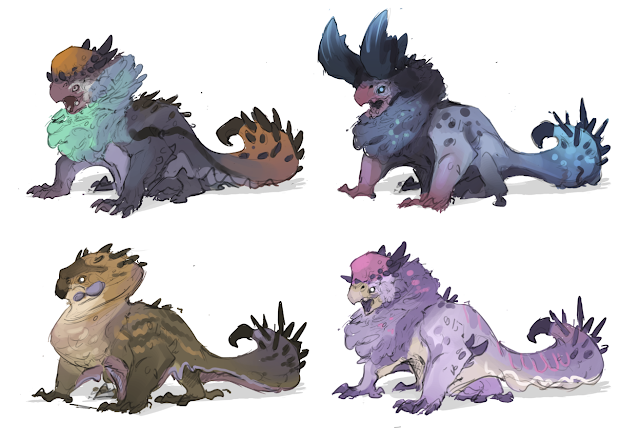 To be honest, by this point I knew I wanted to work with the brightly coloured pachycephalosaur design. But there's definitely a soft spot for the more desert dwelling variant. 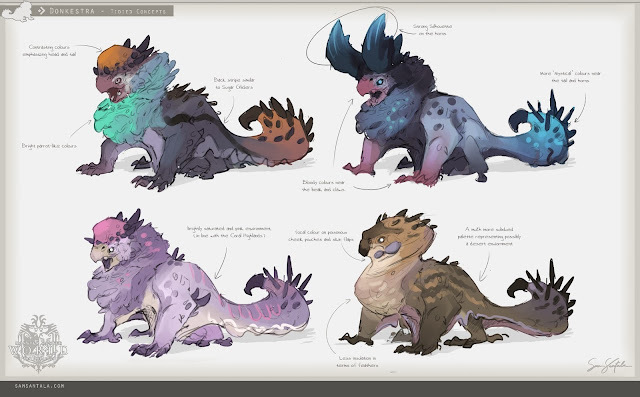 At some point in the future I may come back and look at this critter for reference on future monsters. And with the basic design figured out it was time to start the anatomy breakdowns. You can see from the image that the Donkestra is at roughly a 3/4 angle. This makes it easy to figure out proportions to a large degree, but some extra help was needed, and some some rodent x-rays really went a way to help me figure out just how this creature might work anatomically from this strong side angle. Doing this level of anatomy also taught me how I needed to adjust things like, the thickness of the Donkestras neck to accomodate such a hard force placed upon it upon striking a target with its head. 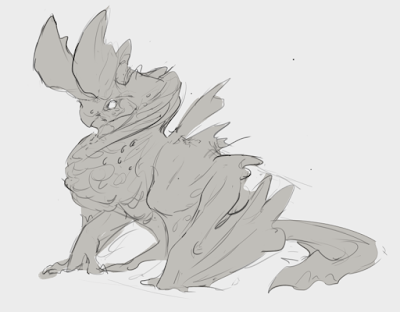 or how I should add a small bird-like sternum to this creature to allow for stronger control over it's direction in wind currents using its chest muscles. 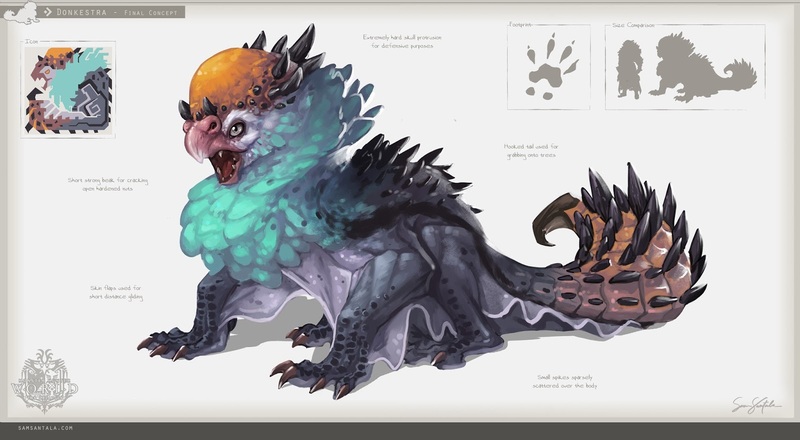 As with any Monster though, players will eventually begin hammering on this creatures hide, and that will cause some 'consequences'... A damage sheet would be needed. It's not the prettiest, but it is effective. Through this sheet we can see that the Donkestra can lose or damage many of its spines, have its hide torn, or even have its tail cut off. For the sake of potential modellers I also added a smaller turnaround for the tail part, so its anatomy could remain consistent throughout. For the sake of clarity I draw up a version both with and without the feathery neck. This would allow a clearer indication of just where this skin ends and the feathers start. Now the main concept had been completed, but it was lacking a bit of life in its design. So I created several sketches of the Donkestra, doing what it would do in its normal every day life. And it was complete! Now I just needed to make the presentable and worth putting on my portfolio. The Donkestra was a good learning experience, both for anatomy, presentation and rendering and I hope you enjoy it! And if you'd like to see more of my work check out the links to my portfolio and Twitter account. I decided to spend some of my spare time the last few weeks doing some armour studies. This had initially started as just a bit of practice on the side, but after some really positive feedback and some requests for a tutorial I ended up making an entire collection of texture spheres and cleaned up a lot of the studies so people could better understand how to paint these types of things too. Firstly we have the finished studies themselves. I had tried gathering a few different types of armour specifically to understand both their design, and their material properties, so we have things from clean plate mail to tanned leather and rusted metal. These took some time on their own, but I then decided to create material spheres for as select few textures. How do you create armour from a fictional Monster whilst retaining its identity? 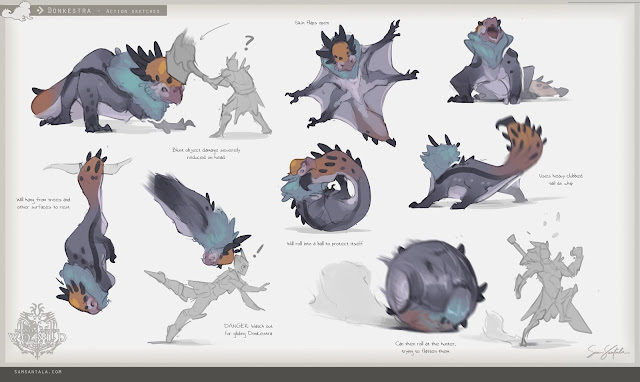 (NOTE: This is a sister post to creating the Monster Hunter fan creature: 'The Donkestra'. These armours are what I felt came to feel, both individual against the collection of armours Monster Hunter sports, and individual to the base Monster, the Donkestra (seen below). The Donkestras most discernable traits were its large round head, its bright feathers, and its pale skin flaps. With its secondary traits being the dark spines that covered its body.